Our supply of technological services doesn’t stop at just the health of your teeth! 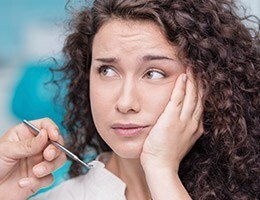 If you constantly find yourself plagued by TMJ pain, such as a stiff, sore jaw and headaches, we can use computerized services such as our TENS machine, K-7 muscle scanning unit, and Tekscan sensors in order to properly diagnose your condition and determine the best course of action. Dr. Olsen and his well-trained team will use these technologies to determine a therapy that is specifically designed to give you healing, reduced inflammation, and the best resolution of your symptoms. Staying on the cutting-edge of dental care helps us provide relief from TMJ pain and chronic headaches. Few people realize that jaw problems can lead to a wide variety of issues in and around the head and neck region. Issues with the temporomandibular joint, otherwise known as the TMJ, can cause pain in the head, neck, and shoulders. TMJ pain, muscle aches, and headaches can interfere with your ability to move through life comfortably, robbing you of the ability to concentrate and even enjoy your favorite activities. However, with our neuromuscular approach to treatment, we can alleviate both TMJ pain and headaches and have you happily getting back to the things you love in no time. The first step in any TMJ treatment plan is to determine what is actually causing the pain. Is it arthritis in the joint? The result of an injury? A misalignment of the bite? Determining this answer will help us figure out the right solution. Using our K-7 scanning unit, we’ll be able to find the perfect position for your jaw, and then Dr. Olsen will help you achieve it through a variety of non-invasive treatments. When the bite is misaligned, this can cause the jaw to make small adjustments whenever you open and close your mouth. These can put quite a bit of strain on the joint and muscles, leading to TMJ pain. With an equilibration/occlusal adjustment, we can slightly reshape a few key teeth so that the bite is perfectly aligned. This will allow the jaw to reach its natural resting position, which should help relieve any tension and pain. This phase of TMJ treatment usually involves the use of either a Bite Splint or a custom made Orthotic. These devices can be used to address a variety of TMJ-related problems. Each splint is custom-made for every patient, and they work by slightly shifting the jaw into a physiologic rest position. Over time, this will enable the muscles and joint to heal and find this new, healthier orientation on their own. Some patients are able to stop wearing the splint after just a few months, though some need to continue wearing it in order to keep seeing results. This happens after Phase 1 treatment has been successful in getting rid of your pain and other symptoms. 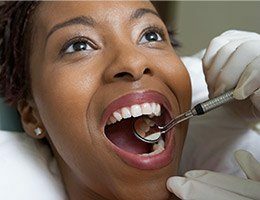 It can involve use of a night time appliance, orthodontics, and even reconstruction of the teeth to settle into the new physiologic bite for a most permanent correction. Dr. James Olsen will discuss your options and help you achieve the course of treatment that is right for you. A TENS unit is a muscle stimulator used to create a physiologically relaxed state of the muscles. It provides a small impulse to the jaw, neck and shoulder muscles using just a 9 volt battery. It is a valuable tool in relaxing the muscles so we can achieve a bite registration in a physiologic rest position. it is also useful in the treatment of some types of TMJ dysfunction and associated pain.